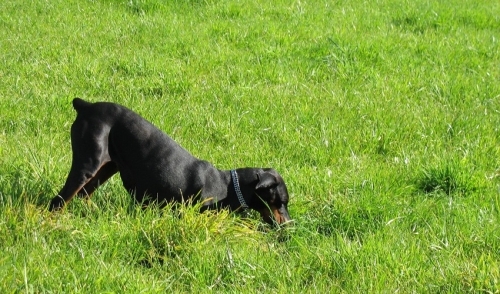 First, understand why your dog is digging in the first place. This is important so that you may respond to your dog in the best way possible. More often than not the solution is a lot easier than you think. In hot weather, dogs dig holes to lie in the cool dirt. Dogs will also dig holes to protect themselves from the cold or to find food or water. A good way to recognize that your dog is digging for comfort or protection is if your dog digs holes near the foundation of your home, large shade trees, or if it is lying in the holes it digs. To fix this, simply provide your dog with the comfort or protection it needs. Bring your pet inside to prevent overheating. 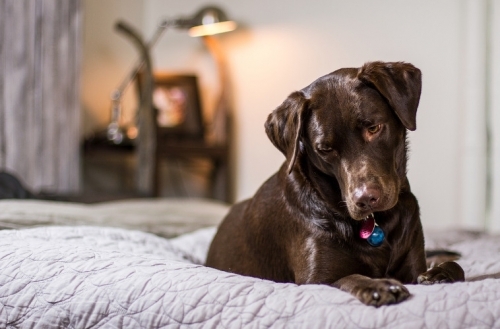 Make sure your dog has a place it can call home where it can seek shelter to be comfortable away from the cold winds and sun. Some dogs dig because they are bored and seek fun. Think of kids and their imaginary friends. Once a dog realizes that the roots and soil play back just like an imaginary friend, it will pick up digging. If you leave your dog alone in the yard for long periods of time or if its environment is lacking toys or playmates, it can lead to your dog digging. To keep your dog entertained, walk your dog as often as possible. Exercise is not only good for your dog’s physical health, but its mental health as well. Keep your dog amused by teaching it new tricks and playing with it as often as possible. A tired dog is a good dog, and a good dog doesn’t dig holes. You should keep toys and bones lying around the house and yard to mix things up and keep it interesting for your pet. Occasionally dogs dig holes because they seek attention. If your dog digs holes in front of or if you travel a lot, your dog may be digging to attract an audience. If your dog doesn’t receive enough attention, don’t enable it. Praise your dog often so that it knows you care and make sure to play plenty of games with it like taking it for walks and playing games of fetch. Continue to safely discourage your pet by placing stones on newly dug holes, use citrus peels to guard the area, or even use their own feces. One important tip is that it has to be their own feces, another dog’s won’t work. For some breeds, like the Australian Cattle Dogs, digging is completely natural. Never punish your dog for digging so if you need to, create a digging zone for your animal. These types of dogs are considered to be dedicated diggers. To stop your dog from ruining the rest of your yard, create digging zones similar to how you would create a child’s sandbox. To reinforce the use of the digging zone reward your dog with praise when it uses the digging zone instead of your flower bed. Once you understand why your dog is digging, act accordingly. Keep a close eye on your dog and show it love to prevent it from digging up your yard.